This year brings two very special anniversaries for Elizabeth von Arnim. On 31st August 1866, Mary Annette Beauchamp, known to us now as Elizabeth von Arnim, was born in Sydney, Australia. In 2016 therefore, we will be commemorating the 150th anniversary of her birth. We can also note that she died at the age of 74 on 9th February 1941 in South Carolina in the United States. So the 75th Anniversary of her death occurred in early February this year. In order to mark this special year, the International Elizabeth von Arnim Society has chosen a new variety of rose from Dickson Roses to be named ‘Elizabeth von Arnim’. 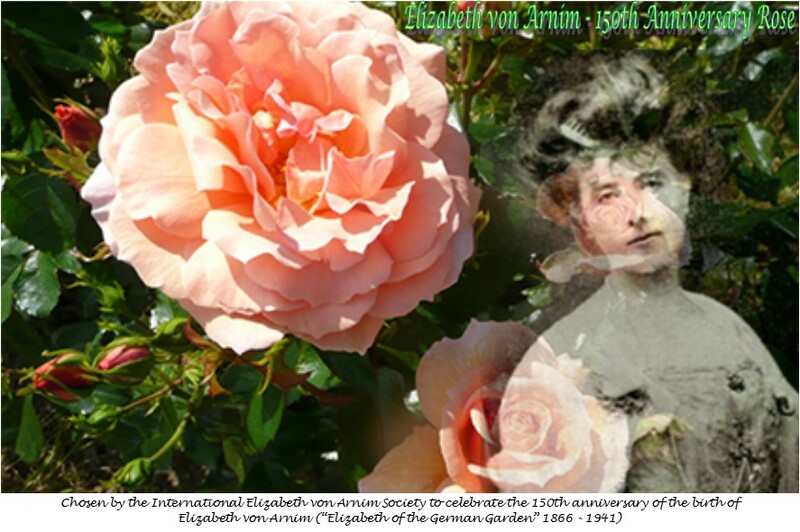 Roses were always loved by ‘Elizabeth’ and are particularly associated with her first best-selling novel, Elizabeth and her German Garden (1898), in which she tells her readers of the rose beds she is creating around the sundial at Nassenheide. In the 1930s, she created a wonderful garden in her home at Mougins in the South of France, calling it the ‘Mas des Roses’ and filling the garden with roses. The Society is very grateful to Dickson Roses for helping us with this project, making their beautiful rose variety available for naming, and for supplying 30 bare root roses to those members who are able to find space to plant them. We are delighted that the literary and personal association between ‘Elizabeth’ and roses can be celebrated in this special way.